Abraham Cornelius Isaak: teacher; born 6 August 1906 in Kaltan, Neu Samara, Russia, the oldest of 13 children born to Cornelius Abraham Isaak and Cornelia (Kliewer) Isaak. 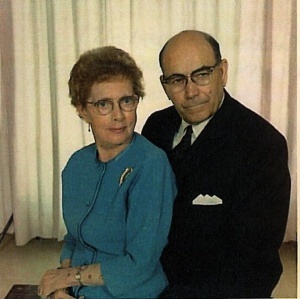 On 14 August 1932 Abraham and Mary Friesen (14 October 1905, Lugovsk, Neu Samara, Russia - 9 January 1968, Abbotsford, British Columbia, Canada) were united in marriage. Four sons were born to Abraham and Mary: William, Rudolph, Edward, and Ronald. After Mary passed away, Abraham married Elsie Warkentin (4 January 1924, Davlekanovo, Ufa, Bashkortostan, Russia - 13 September 1974, Abbotsford, British Columbia) on 27 December 1971. While visiting his youngest son Ron in Toronto, Abraham died of a heart attack. His remains were returned to Abbotsford, and buried in the Hazelwood Cemetery. When Abraham was two years old, the family moved to the Mennonite village of Gnadenheim in Barnaul, Siberia. Here Abraham was able to complete his elementary and secondary education, and also attend teacher’s training school. In October 1924 the Isaak family immigrated to Canada, first settling in Estevan, Saskatchewan. After moving to Yarrow, British Columbia (BC), Abraham was able to continue studying at Chilliwack Senior High School, in time completing Grade 13. After high school, he entered Normal School training, in preparation for a teaching career in British Columbia. For many years during his teaching years he enrolled in summer school courses at the University of Victoria, eventually earning his Bachelor of Education degree. Owing to discrimination against Mennonites during the 1940s, it was difficult for Abraham to find a teaching position in British Columbia. However, owing to a shortage of teachers at the time, his first teaching appointment was in Narcosli Creek Elementary School, near Williams Lake, in the Caribou region of BC. In 1946, Abraham was hired by the Abbotsford School District. Over the years of his career, Abraham taught in several Abbotsford elementary schools, including North Poplar, Kilgard, King Road and Ridgedale. He is remembered for having introduced 16 mm films as new teaching tool at the time. As the first Mennonite teacher in the district, Abraham C. Isaak was a trailblazer for many others co-religionists who entered into educational careers in secular settings. GRANDMA (The Genealogical Registry and Database of Mennonite Ancestry) Database, 6.02 ed. Fresno, CA: California Mennonite Historical Society, 2010: #1034622. Isaac, William A.. "Isaak, Abraham C. (1906-1977)." Global Anabaptist Mennonite Encyclopedia Online. August 2010. Web. 21 Apr 2019. http://gameo.org/index.php?title=Isaak,_Abraham_C._(1906-1977)&oldid=141169. Isaac, William A.. (August 2010). Isaak, Abraham C. (1906-1977). Global Anabaptist Mennonite Encyclopedia Online. Retrieved 21 April 2019, from http://gameo.org/index.php?title=Isaak,_Abraham_C._(1906-1977)&oldid=141169.